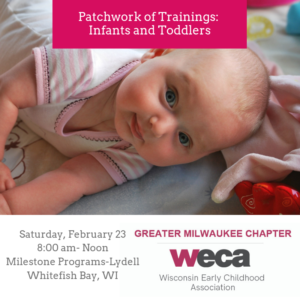 Greater Milwaukee Chapter of WECA is offering the same great workshops, now offered as four mini trainings. Each “Patchwork of Trainings” will have a focus age group with a tour of the hosting center. Two workshops will be offered during that training. Do you struggle with the 30 minute napper, the infant who needs to be “entertained” or when and how to introduce solids? This session will give you a few tips and tools to make your day run a little smoother. We will share with you some pointers that have helped us through some challenging moments and answer any questions you may have about infant care. Participants will learn what loose parts are and how to use them with infants and toddlers. Tips, suggestions, and resources will be shared, as well as hands-on experience. If you are already familiar with loose parts, bring photos and stories to share (if you put the photos on a flash drive we should be able to project them for all to see). If you want to learn about loose parts or get some new ideas, this session is the place to be.